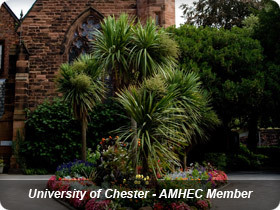 AMHEC stands for the Association of Managers in Higher Education; a network of managers from the Higher Education sector, covering all disciplines, that brings together a broad wealth of expertise and experience from across the UK. With 19 higher education institutions in our membership, we aim to encourage and support the exchange of information and knowledge about our business and developments in the sector; provide a forum for debate upon how we can improve our strategic focus, working practices and services; and offer opportunities to network with sector colleagues. Please see Membership Information on the Joining AMHEC page. Please click here for more information. We currently have 19 higher education institutions with membership. For their details and to see if your HEI is a member please refer to the Members page of the website. Please click here for more information. Membership of AMHEC is open to anyone with managerial responsibility in a UK HEI. Our current membership includes Pro Vice Chancellors and representatives from Academic Services, Finance, HR, Health & Safety, Student Services, Registry, Facilities, Marketing and Estates and is complementary to other specialist networks. Membership is based on size of institution, based on student FTEs. To find out more about the benefits of being a member, please refer to the Joining AMHEC pages of the website. Please click here for more information. How many members can join from one institution? What other organisations do you link with? AMHEC has a close association with the HEFCE, NCTL, GuildHE and UCEA and they are regular contributors at our conferences and workshops. We were also the lead influence in setting up HE Shared Legal. For more information about these projects please see the Useful Links page of this website. Please click here for more information. What topics have you covered recently at your conference and workshop? We have covered a broad range of topics covering a number of professional disciplines in the sector, and in addition to our regular contributions from the Hefce, TDA, GuildHE and UCEA, we have covered areas such as employee engagement, communications, delivering to promise, teaching & learning environments, shared services, environment & sustainability, widening participation, competitiveness & viability, student mental health and organisational wellbeing to name but a few.